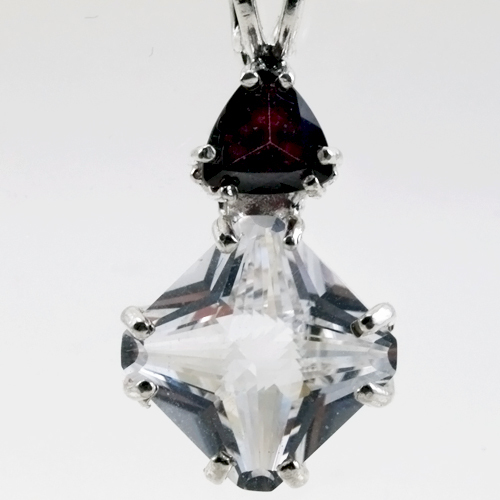 Dimensions (HxWxD): 1" x 0.55" x 0.2"
This beautiful clear quartz Mini Magician Stone crystal pendant is crowned with a large, deep dark red trillium cut Grape Garnet gemstone of exceptional quality, both in the style of the stone and in the simple silver band setting which allows the stone to breathe and function at its highest vibration. Garnets are vitreous, translucent hexocatahedral gemstones with a hardness rated significantly above quartz crystal, characterized by the presence of aluminum and manganese, which imparts their striking reddish orange color. Garnets have been used for millennia in shamanistic healing and spiritual traditions across the globe, by Native American Indians, Aztecs, Mayans, and African medicine men and healers. Garnet is also one of the stones found in the breastplate of the Israeli High Priest in the Old Testament. Experienced crystal healers and Lightworkers familiar with these unique garnets tell us that they activate and energize the first and second chakras, which are considered to be red (base) and orange (second chakra) in the Western chakra system. The first chakra is the seat of our vital energy, our survival instincts, and our sense of personal security. The second chakra governs the genital organs and lower abdomen, and is connected with sexuality, vitality, personal magnetism, and personal affluence. Thus wearing a garnet will increase the flow of vital energy through the first and second chakras, giving a sense of increased energy in the body-mind and aura. According to the ancient lore of medieval Western gemstone therapy, garnets act as magnets for money as well as potent attractors, increasing one's affinity for potential sexual partners and existing love relations. We have been guided to tell you that the bearer of a garnet can expect to attract wealth and abundance and to become more attractive personally, so be careful not to squander money that comes to you or to abuse the personal magnetism that you are sure to feel when carrying one of these garnets, or when using it on your altar! Note: Weight above is shipping weight. Average weight of this pendant is .188 oz. Each piece is unique and may vary slightly in appearance. Each piece is guaranteed to be beautiful and to meet with your complete satisfaction!